National University Published Masters First Part Exam 2017 Form Fill up Notice. In the Notice, NU explained that this is the Form Fill up a notice of Masters First Semester Exam which will start on the May 2019. The Authority has currently announced the System of Form Fill up, Total Fee and all other systems in the Notice. They have also informed that the Details Exam Routine will be announced. National University Masters Form Fill up Notice 2019 is for the Students of Masters 1st Semester 2017. Many people are asking about the Notice of NU Masters Form Fill up which released on 18th March 2019. So, We have added the Full Notice in the below where you can read details of Eligibility for the Exam, Total Amount for the Form Fill up and other Guideline. The Student needs to pay the Desired Amount via Sonali Sheba. 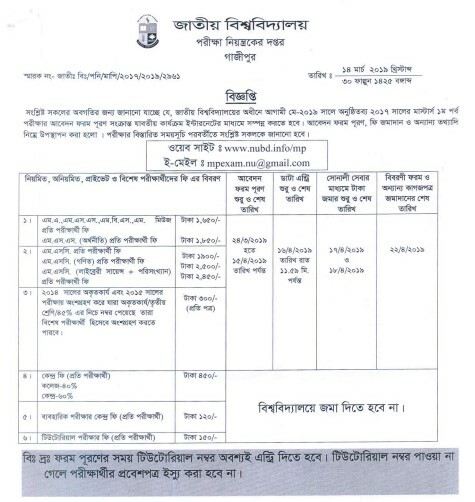 The Form you will find on the National University Official Website www.nu.edu.bd. After downloading the Form, you can pay it to any Branch of Sonali Bank Limited, Bangladesh. You are also welcome to check the Other Notice, Result or Routine Information of Bangladesh National University which will available on this Website. Thanks for staying with us.